Jim Meyer's Borderlands: Blechsit: the Breakup of Britain? Seriously, though, it seems like a pretty big deal that one of the closest-perhaps the very closest--US ally could very well disappear from the world map within a number of years. Countries really do vanish from the map, my friends. Just ask the folks in Yugoslavia about that. Am I overreacting? Possibly, but the government in Scotland has already announced that they would like to hold another referendum. And who could blame them? The last time they voted, they thought they were voting to remain in a country that was in the EU. And Northern Ireland? There was a pretty strong "remain" majority there, presumably because many people see EU membership as having played a key role in keeping peace in that region for the past twenty years. What's going to happen there now? If the UK's withdrawal from the EU is protracted, or if there's a lot of haggling over the terms of the divorce, I could see conditions inside the not-so UK getting particularly messy. 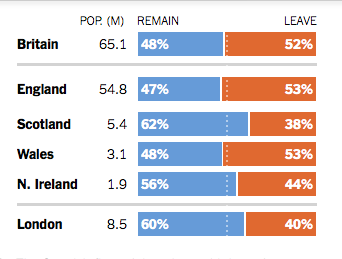 Wait--how did Wales end up at 101%? And what's Wales going to be now--England's Montenegro? Well even Montenegro, which hung on as the No. 2 republic in Yugoslavia long after everyone else but the Serbs had fled, broke off from Serbia and is now a candidate for both NATO and--of course--EU membership. Hey, Montenegro: I hear there's an empty seat available. Hungry for more news, I tuned in to NPR's All Things Considered. As usual, I found myself disagreeing with almost every point of substance that David Brooks made. Does that ever happen to you too? Anyway, they were talking about Brexit, of course. Brooks blamed it all on 'the rise of nationalism." What we saw in the UK, argued Brooks, constituted "one step in the rise of ethnic nationalism" in which people are "clustering along class lines, ethnic lines, ideological lines," etc. Brooks' solution? Still more nationalism. "We need a better nationalism that's not so parochial," he said. Yikes. Before I respond, let me make a few points for the sake of clarification. a) Nationalism doesn't "do" things, people do. I tell my undergraduates not to assign agency to abstract concepts, so I might as well point it out here as well. Instead of talking about how nationalism and religion "do" things, we actually need to acknowledge the fact that we are describing the undertakings of people speaking in the name of nationalism or religion. We are the ones to blame, not abstract forces. b) Most people wouldn't consider class and ideological conflicts to be examples of "nationalism." Quite the opposite, actually. Again, like some of my weaker students during the opening weeks of a semester, Brooks is interpreting virtually any sort of collective identity in terms of "nationalism." Rather than "nationalism," I think the term that Brooks probably wanted to use here is "identity." c) The countries, other than England, that together make up the UK might leave the union not so much because they are "clustering" along ethnic lines, but rather because their citizens might prefer to remain in the EU. Any breakaway from the UK by Scotland would be a result, at this point, not so much because of "feelings about nationalism," but rather would be due to concrete, tangible benefits that people associate with EU membership. Any re-opened wounds that people might be feeling in Northern Ireland would be less the result of "nationalism" and more because of a sense of betrayal related to people's anger about being dragged out of the EU by England. This is how countries break up, and it's not because of collective madness, a virus, a cloud of "nationalism" covering up the sun, or other fantastical explanations. More than anything, developments like this take place, at least in peaceful times, because of a failure of leadership among those in power. And that's precisely what seems to have been going on in the UK. The divisions are already there in the way in which the UK is organized. Like those other countries that have broken up in my lifetime--stunningly, it always seems at the time--the UK already has the potential to break up not on ethnic lines but rather according to the internal borders that are there right now. In other contexts, I've written about the mini-republics that made up ex-Yugoslavia, the former USSR, and the present-day Russian Federation. Most of the conflicts we've seen in these places have taken place in areas where there are already demarcated borders. In fact, the presence of these borders, I believe, has often proven to be a destabilizing condition, while the lack of mini-republican borders often makes the prospect of separation much more difficult. Perhaps this is one reason why, in the 1990s, the Muslim populations of the Sanjak region in Yugoslavia did not suffer the same fate as Muslims in Bosnia. 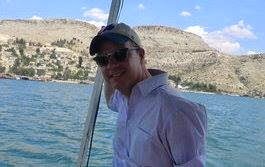 Non-Muslims in Bosnia did not fight and kill simply because of their intangible "feelings about nationalism," but rather because they had a concrete goal: separating the regions they lived in from Bosnia, and in order to do that they had to remove Muslims by killing them or threatening to do so. In Scotland, there would be nothing particularly nationalistic about people now voting to remain in the EU by leaving the UK. No chest-thumping would be necessary. Instead, such a move would be an extension of economic and political self-determination. The Scots, or at least most of them, were fine with staying in the UK for as long as they thought the UK would remain in Europe. The Brexit, obviously, changes things considerably. I don't think we need "a better nationalism," whatever that's supposed to mean. 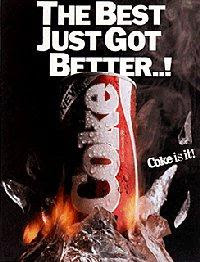 Instead, I think we need people to defend the political center and mend the Cold War-institutions that we've been riding through the past quarter-century of post-Cold War living. While it might be tempting to view political events strictly through the prism of identity politics, we have to understand that people voting both for and against Brexit were doing so in response, primarily, to real issues and not vague concepts of identity. Those issues--relating to the economy and immigration--need to be addressed. Hey--have I ever mentioned the fact that I published a book about eighteen months ago? 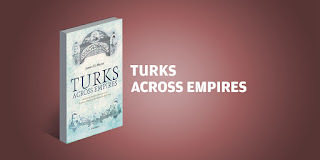 Well, in that book--it's called Turks Across Empires in case you haven't heard--my goal was to ground discussions about national and religious identity within the political, social, and--you guessed it--the mobility (think migration) related contexts of the late imperial era. Which, I argue, was a time that had much in common with our own. Revolution, mobility, and the politicization of civilizational (religious and national) identity--that's the era we're living in now, like it or not. 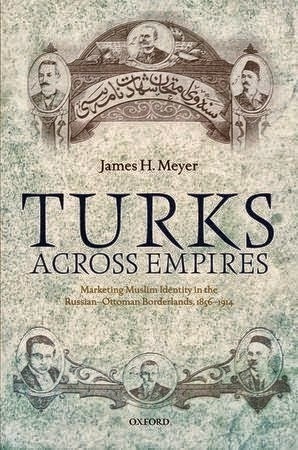 While it might be a lot easier for all of us to pretend that the geopolitical issues of our time derive from a clash of civilizations, I argue in this book that--even in the case of the icons of Turkish nationalism that I investigate--we usually see that these developments are deeply embedded within concrete concerns relating to economics and political power. Once we take the time to unpack the issues embedded within nationalism or other politicized forms of collective identity, simply blaming it all on "nationalism" no longer makes sense. All of this means, in the case of the upheaval in the UK and the Trump campaign in the US, that politicians need to start dealing better with issues relating to trade and immigration. It's people's insecurity and frustration about these issues--and not some vague "rise of nationalism"--that is driving the political chaos in the UK at this time. People are pissed off. They feel they've been screwed over by decades of Reagan-Clinton-Bush-Obama neoliberal free trade pacts, and in a situation like this it seems like Hillary Clinton would be a particularly weak candidate to run as the defender of civilization. But at the same time, hopefully this British cluster-cake will demonstrate to at least some Americans the dangers of fecklessly using their vote as a protest this fall, no matter how messed up things might look at the present moment. I'm looking at you, Bernie Bros, alongside the Trumpsters. Because if Americans aren't smart enough to pay attention to what happens in the not-so UK now, the world will be in even bigger trouble than it is already. 185 librarians can't be wrong! 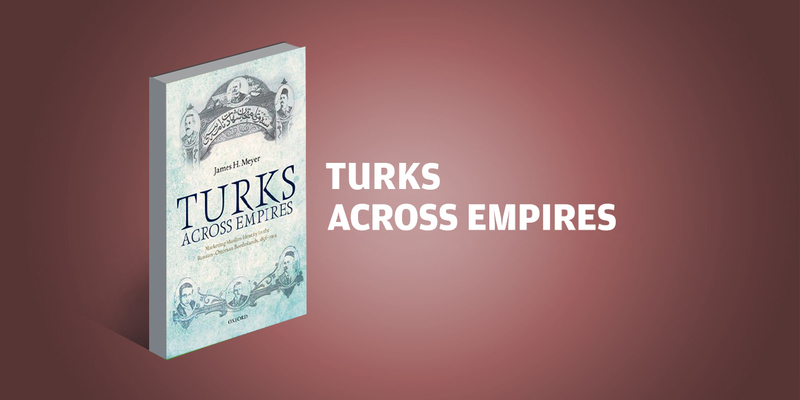 Order a copy of Turks Across Empires today. More commentary, photos, and links can be found, comme toujours--at the Borderlands Lounge.